On Monday, April 2, the National Archives released the 1940 census and historians and genealogists have dug in looking for ancestors and historical figures. The decennial census is conducted every ten years (as the name indicates) to count the population and to apportion representatives; the 1940 census also included several questions designed to measure the impact of the Great Depression and the effects of New Deal programs on the nation. John F. Kennedy can be found in this census as a 23-year-old college student, twenty years before his election to the presidency. Because the census is not yet indexed by name, I began by determining Kennedy’s residence in April 1940. This proved slightly tricky because during that time, Joseph P. Kennedy, Sr. was serving as America’s ambassador to England and John was finishing his senior year at Harvard College. In 1940, college students were enumerated at their parents’ homes rather than at their college addresses, so although we know that John spent April 1940 living in Winthrop House at Harvard, he was not counted there. Hoping to find John F. Kennedy at his parents’ home in New York state, I searched maps of 1940 enumeration districts looking for Bronxville, New York: http://stevemorse.org/census/unified.html. The Kennedys’ street address of 249 Pondfield Road falls in Enumeration District (ED) 60-29 – approximately where the hyphen falls on the map. Armed with this information, I downloaded the census schedules for ED 60-29 and started looking through the 34 pages block by block. The entire Kennedy family appears on Sheet 9B, at 294 Pondfield Road, enumerated on April 15th. The notation “Ab” indicates that Joe Jr., Rosemary, John, and Robert were temporarily living away from home. John, on line 56, is 23 years old and attending school, having already completed three years of college. All of his brothers and sisters were also attending school that year – from Joe Jr. in law school to Edward in third grade. Joseph P. Kennedy’s occupation is listed as Diplomatic Representative for the U.S. Government, working 40 hours per week for over $5,000 annually; both he and Rose also received income from sources other than wages. John F. Kennedy enumerated in 1940 with his family in Bronxville, New York. Series T0627, Roll 02820, Frame 00867, Sheet 9B. Rosemary, John’s sister, was selected for additional “supplementary questions” – known to genealogists as “hitting the lottery.” Two lines per sheet were designated for the enumerator to collect additional information on veteran’s status, participation in Social Security, and employment. Rosemary’s answers can be found at the bottom of the page. Also living with the Kennedy family in 1940 were several domestic workers and their families. Three single women – Loretta Ham, a 45-year old maid; Margaret Ambrose, an Irish cook; and Elizabeth Dunn, a personal secretary from Boston – lived in the Kennedy house. 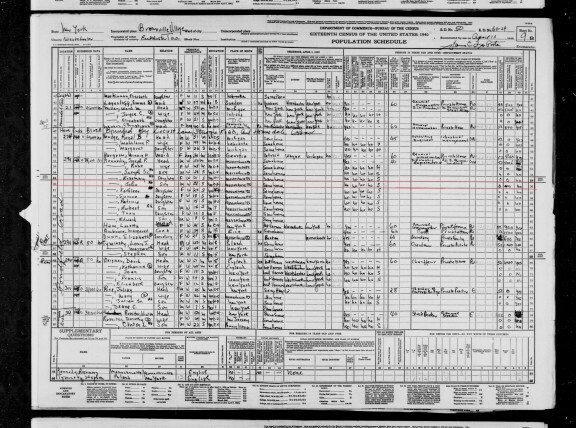 The circled “x” by her name indicates that Miss Dunn provided the Kennedys’ information to the census enumerator. Louis J. Tyminsky, a gardener, and David Deignan, a chauffeur, each lived with their families in separate rented households at the rear of 294 Pondfield Road. These staff members worked 60 hours per week for a range of wages, which are included in the census. 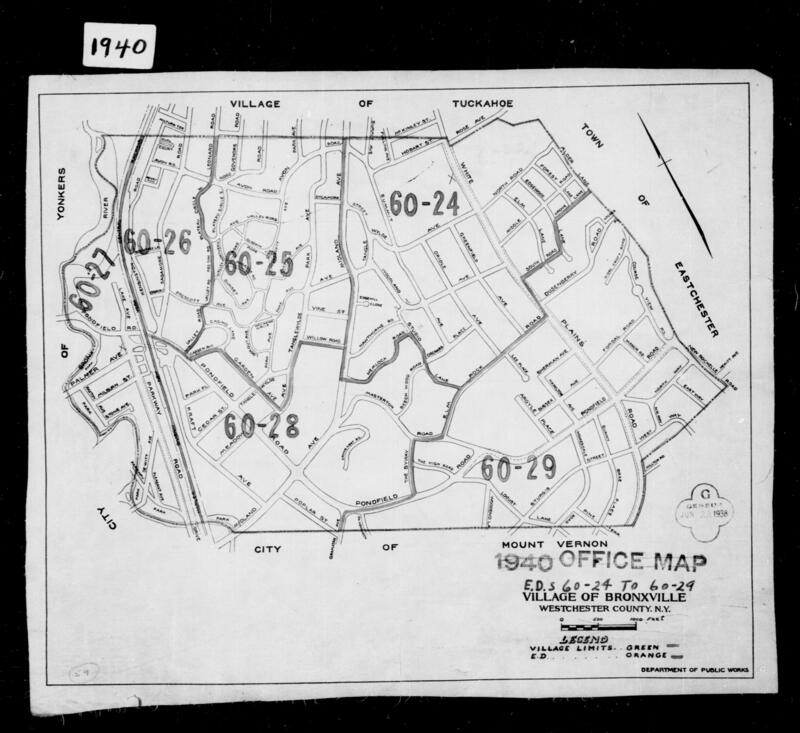 The 3.8 million images that make up the 1940 census are available online to search for free at http://1940census.archives.gov/. Have you looked for your family? Can you find Jacqueline Bouvier, then eleven years old?